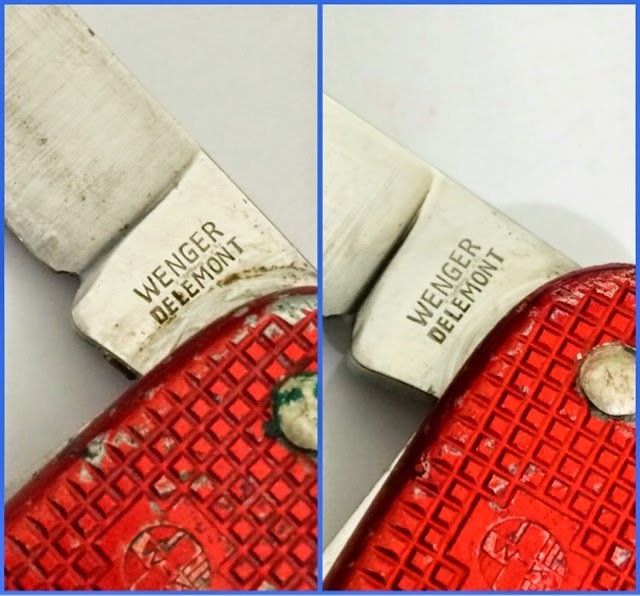 This is the Wenger equivalent of the Victorinox Soldier. 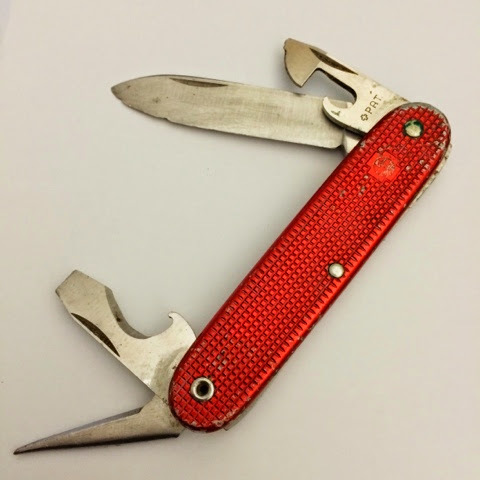 Models produced during 1962 to 1964 had Red Alox scales and brass liners. This practice was discontinued as the red finish usually fades or get scratched up during normal use. 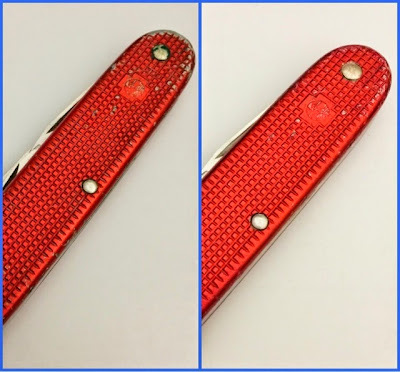 Some more background information from www.sakwiki.com "These new knives were produced with red Alox scales from 1962 to 1964, after which they changed to silver Alox. 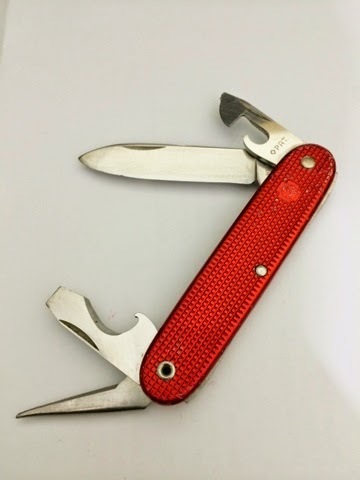 Red Alox models for 1965-1975 are also known to exist with the exception of 1974. As part of the new design the wire stripper notch was added, and hollow rivets were introduced. This model was standard issue to the Swiss military and many others until 2008 (08 is the last tang stamp). Since the knives were issued to soldiers in part to maintain their firearms they were under the supervision of the Waffenkontrolle, and early models contain their 'approved' stamp on the scales." I got this from a fortunate ebay win! Got it cheap together with another Swiss knife (a Victorinox Super Tinker) and two other old pocket knives (a Nomad and a Repeat Needham Brothers - Sheffield). 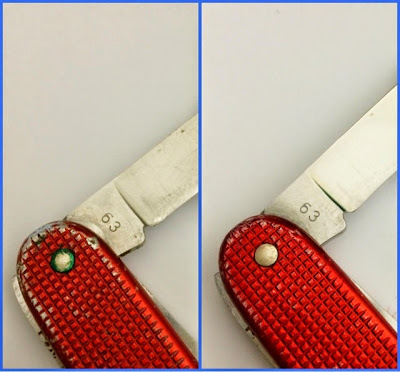 After cleaning thoroughly, polishing out some of the deep scratches in the main blade and removing the oxidation in the brass liners, the end result was quite acceptable. Here are the photos plus the before and after cleaning shots. 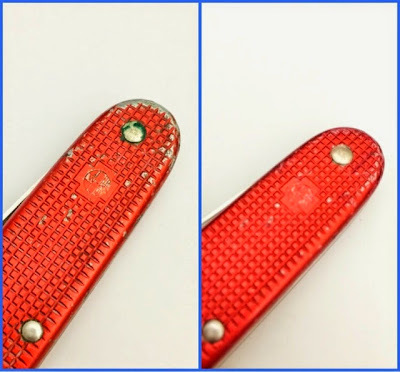 Original state of the knife when I received it from the ebay seller, not bad at all! 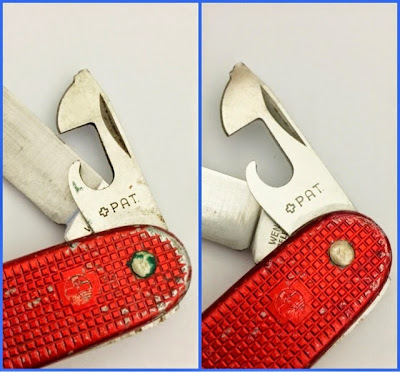 Apart from some fading of the red anodized color, oxidized brass parts and a small chip on the main blade, it was actually in a very good condition considering it is more than 50 years old!!! After a thorough cleaning and some touch ups. The scales were a bit faded specially on the edges (left). A quick touch up did the trick (right). 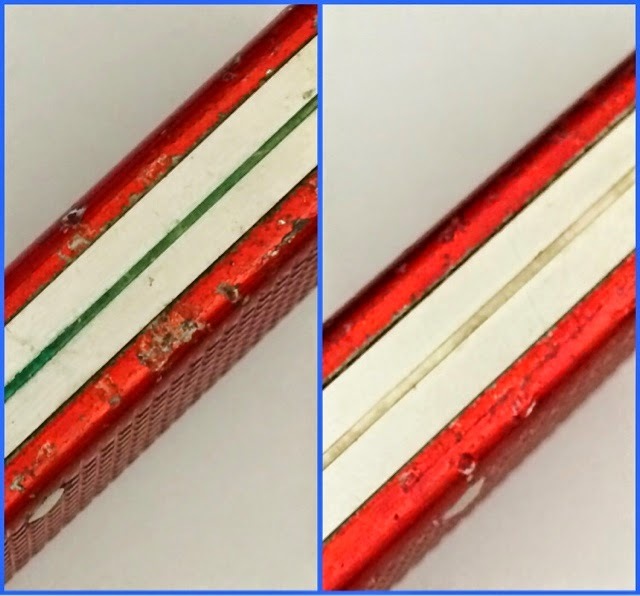 The brass liner has oxidized already (left) but cleaned up nicely after (right). The Standard Issue was produced by Wenger in their Delemont plant and formed part of the contract to supply the Swiss Army together with Victorinox based in Ibach. The "+ PAT" stamp on the can opener was still used in 1963. 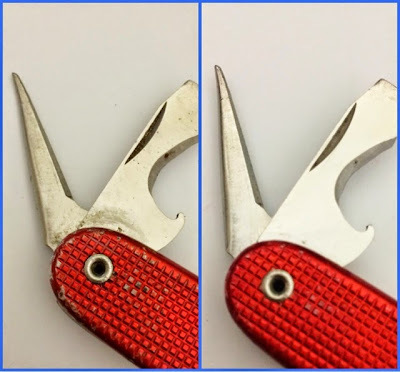 The bottle opener/screw driver tool included a scraper too but without the wire stripper. The money shot! 1963 tang stamp.